DL 8135. Soft and Sweet. 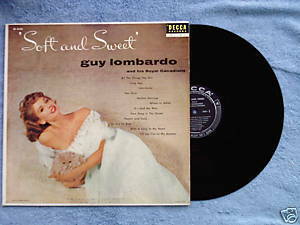 Guy Lombardo and his Royal Canadians play dance band favorites with trademark soft and sweet style. Cover photo by larry Gordon. Vinyl is excellent; cover is VG with some corner wear and slight discoloration on reverse; Decca black label is heavy vinyl.